*I received a complimentary subscription to Le Tote. This is a brand that I have loved building a relationship with & highly recommend that you check them out! As I'm sure you all are already aware, this has been a freaky cool Spring, pretty much everywhere (except Austin, because that place is awesome!) So bringing "Spring" into my wardrobe has been less about shedding layers & more about injecting color. 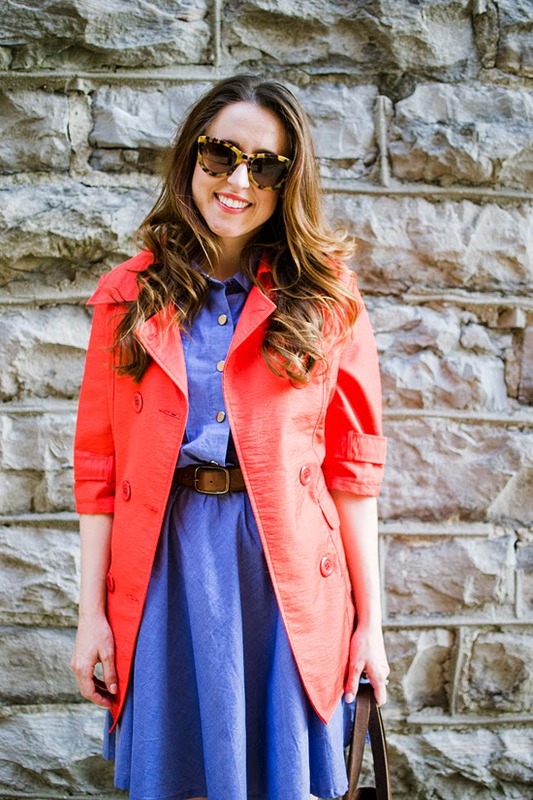 But I'm happy to report that I think I've finally found the perfect compliment to this punchy orange trench - chambray! P.S. Did you catch how I styled my Levi's 501 shorts yesterday? I'm in the running to the Style Hunter's Levi's styling competition, & I greatly appreciate everyone taking a minute to vote for me! THANK YOU THANK YOU! P.P.S. Today is the CAbi Big Event - CAbi is an amazing clothing brand that I was recently introduced to & instantly fell in love with. Find out more about this fun event here. This weather has been crazy! It's way to cold for Spring! I love this look! I love the colors! This spring has been so weird! It's in the 40s in Boston today! I LOVE these colors together! So chic! Love the colors of your outfit! honestly, you have been growing in your style so much and I'm loving your every post! Seriously freaky cool here today in Kansas City! Love both of these colors! I am loving the bright pops of color in this look! I love this dress–and the colors together are awesome! this is such a perfect silhouette for you! 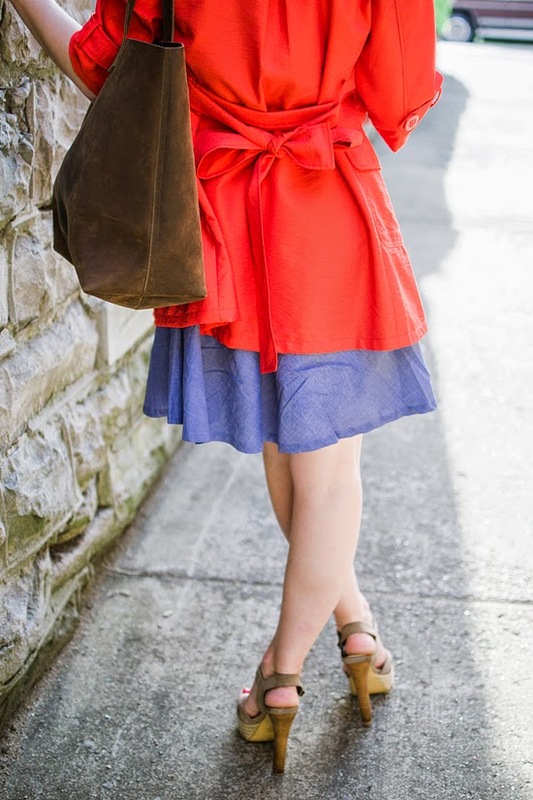 love that wash of chambray with the coral coat. I can't take my eyes off those shoes!!!! Love them and the whole outfit! love that jacket! perfect for spring! Great color combo! However I'm obsessed with those shoes...how perfect?!?! SUCH a cute look! I love love love these heels! These colors are so bright and cheery paired together! Fab color combo. I hope you can pair that trench with more because its a great fit and color! these shoes are perfect with this outfit, because they show a little skin and sass to an otherwise very classy and modest look! well done, you are styled to the T!